“Getting to a certain age and feeling I needed some help with my face I visited several large and small clinics around my area. 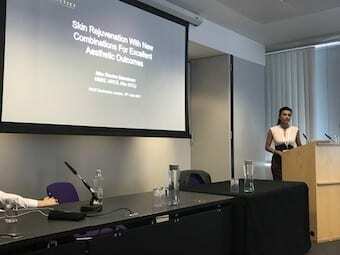 Each clinic was quite happy to pump my face full of fillers and/or botox however the amazing Miss B of S-Thetics was the only person to ask about me, my lifestyle, my beauty regime and actually felt my face and not just holding up the sides as the rest had done! I initially had a HydraFacial – amazing, what a clean and something I have kept up with. 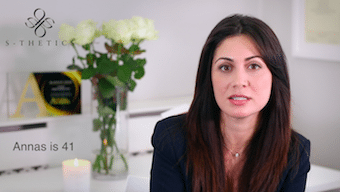 I then had Icon ThreeForMe laser treatment – I am normally rather cynical of these things but the results were fantastic – my skin is brighter, tighter and fresher and my pigment from sun damage is gone, it really does do what it says. Our patient, Nikky, recently had x3 ‘ThreeForMe’ combination laser treatments at S-Thetics Clinic, each taken monthly. The first pass uses Intense Pulsed Light (IPL) technology to treat discoloration for a more even-looking appearance. This includes sun-damage such as freckles, brown spots, or age spots. This pass also addresses unwanted facial veins including broken blood vessels, spider veins and rosacea. The second pass uses a “microbeam” laser technology that will gently renew the skin for a smoother-looking appearance. This unique technology works by stimulating new collagen and elastin production – the keys to the support structure of our skin. 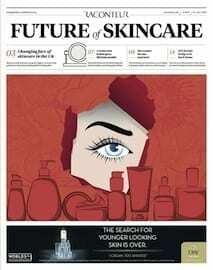 Improved skin structure results in the reduction of fine lines, wrinkles, scars and other surface imperfections. 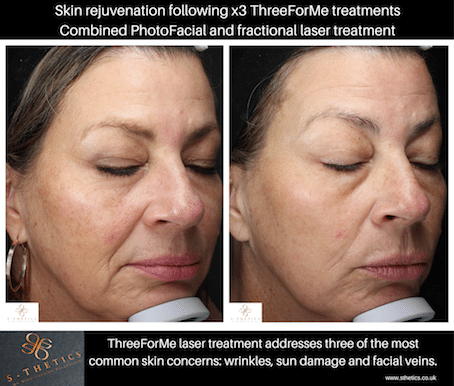 ThreeForMe laser treatments can be safely used on most skin types and for common aging and sun-related skin conditions including wrinkles, sun spots and facial vessels. During your consultation, we will determine if you are a good candidate for the procedure based on a variety of personal factors. Treatment time is around 30 minutes. During ThreeForMe treatments most people feel only minimal discomfort. During the treatment you may feel some mild cooling as the laser is guided over the treatment area along with a slight sensation similar to the snapping of a rubber band. After treatment, you may experience some minor redness and swelling similar to a mild sunburn for a couple days, however this can be covered up with Oxygenetix. All patients have the option of having a topical anaesthetic cream applied to the treatment area(s) prior to treatment. This helps to minimise any discomfort during the treatment. Typically our patients have 1-3 procedures at one-month intervals. However, as everyone’s skin conditions are different, your treatment plan is customised and agreed with you, following on from your VISIA skin analysis and consultation. S-Thetics is an award winning state-of-the-art medical aesthetic clinic located in the heart of Beaconsfield Old Town in Buckinghamshire, specialising in advanced non-surgical treatments for the face, body and skin.